9th St and 6th Ave, Park Slope, Brooklyn. January 21, 2017. I took this the day after Trump’s inauguration, on a street corner smack in the middle of one of the most progressive, well-educated places in the entire country. 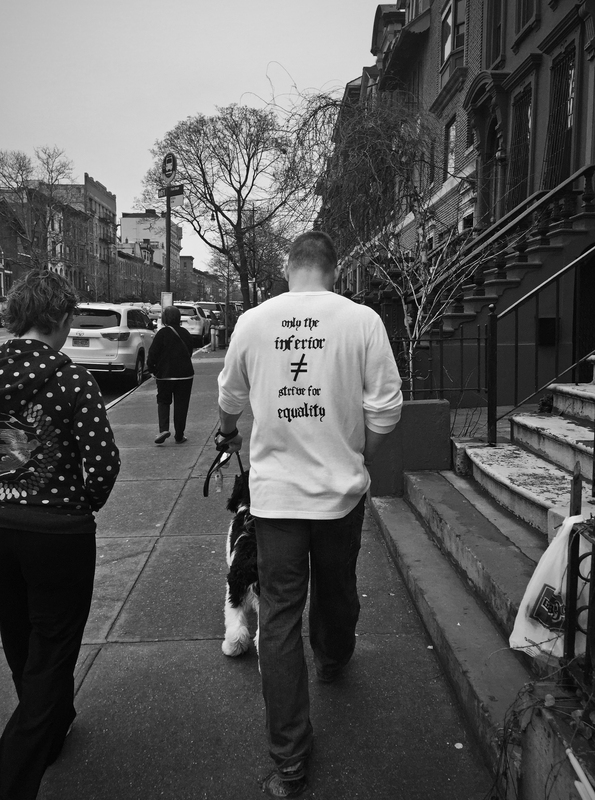 It is without question the most transparent expression of pointless hate speech I have ever seen: a white man, walking a dog in affluent Brooklyn, espousing discriminatory fascism (complete with flagrant Nazi overtones) while flanked by a white trash bag and a woman with a dove on her sweatshirt. I revisit it now because in the months since, this sentiment not only does not seem to have faded, but in many ways seems bolstered by a strange tide of nationalist ignorance, fueled by an endless stream of abject lies from the head of state and its propaganda machinery. It’s become a place where honest journalism is labeled fake, without evidence, when it does not conform to belief systems. Where blue states refuse to travel to red states whose recently-passed laws enable discrimination on religious grounds – and otherwise reasonable people call this refusal fascism, as though to react against destructive discrimination is itself destructive. Where the dominant political party allows thirteen white, male members to draft an entire health care bill that proposes limiting health care provisions in order to reduce costs, while all but ensuring skyrocketing costs and ending coverage for millions – in secret, without public discussion or congressional hearings, calling it “freedom”, and attempting to force a vote within a week of release. Where the President of the United States and nearly his entire cabinet and staff…well, take your pick. How can a nation move forward with these divisions? Where to move forward to? I fear this country is wearing blinders, willfully, because in its youth and self-aggrandizement, it can’t fathom the possibility of the direction we are headed. This cannot be resolved simply by listening to those who disagree with you. There are attitudes that must be made unacceptable again, because equal protection is a moral imperative in a society that remains free – and by all indications, they will not go without a bitter fight. I hope I am profoundly stuck in my own interpretations, and have missed signs to the contrary. This entry was posted on June 24, 2017 at 14:58 and is filed under Commentary, Photography. You can follow any responses to this entry through the RSS 2.0 feed. You can leave a response, or trackback from your own site.